French is the 11th most commonly spoken language on the planet, spoken by 200 million or more people, and the official language of 29 countries and one of the official languages of the United Nations, the European Union, and various international organizations. The French language can be found in other parts of the world other than France, like in former French colonies throughout Africa, Southeast Asia, and the Caribbean. French is additionally, one of the two official languages of Canada, and for those living and working in Canada, French language translation is a crucial part of everyday life. If you are a business owner, politician, or someone with friends and family outside the country, French translation is likely a part of the way you stay connected. Though translating the French language is much more difficult than merely replacing words from French into English. Your French translator should also understand the subtleties of the French tongue and the turns of phrase on which the language turns. Let's say for instance, translators know that French varies from region to region (even with the moderating and standardizing effects of the French Academy in Paris), and certain phrases in Canadian French may be somewhat different from their Parisian counterparts. Even within France itself, the official French of Paris is quite different from dialects and related languages spoken in the departments, particularly in the south and northwest. After all, translation is not a demanding empirical science but rather an art that uses an understanding of the way language is lived and used to bring the speaker's meaning across into a new language..
Technovate Translations recognizes the difficulties involved to generate top quality French translations, and we work tirelessly to produce only the best and most precise French translations on even the shortest deadlines. To accomplish this, we utilize the services of the most talented French translators who speak the language as their mother tongue and therefore know the expressions, phraseology, and slang that make French a rich and vivid world language. These translators are backed by a high quality control system that makes use of the talents of an additional French language expert to review each translation for accuracy and to ensure that it is fluid and highly readable before we send the final product on to you, our clients. This level of support promises the best translation every time you place an order. If you ever feel like you are in need of expert French translation, whether for your profession, for education purposes, or for personal or legal translation needs, we have the expert translators you need for the most powerful French translations in the industry. Our translators go beyond language skills and integrate their subject matter expertise, meaning that our writers are familiar with the types of documents they translate in order to give you the best translations. Translators with financial expertise translate financial documents; translators familiar with legal documents translate legal documents, and so forth. 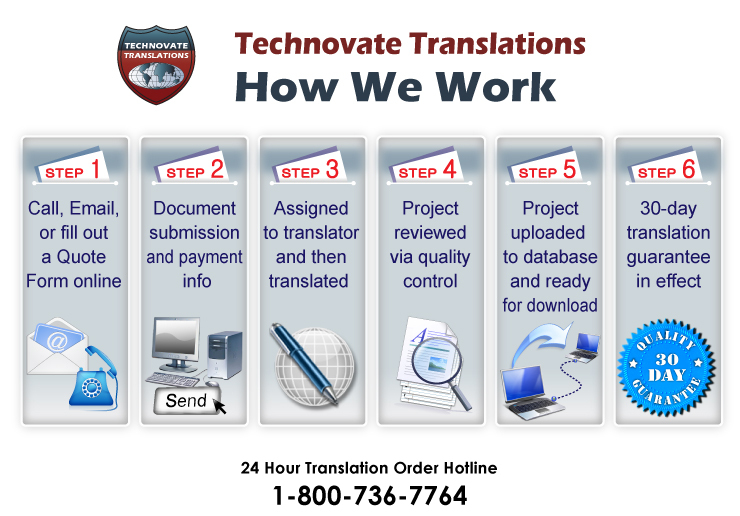 Doing so enables us to give you the best quality translations possible.